Lowered heights from 5" to 10"
Raised heights from 30" to 94"
Capacities up to 12,000 lbs. AQ-P-25-005 500 lbs. 25" 5" 30" 12" x 25"
AQ-P-30-010 1000 lbs. 30" 6-1/4" 36-1/4" 16-3/8" x 34-3/8"
AQ-P-36-020 2000 lbs. 36" 6-1/8" 42-1/8" 17-1/2" x 41-1/2"
AQ-P-48-015 1500 lbs. 48" 6-1/8" 54-1/8" 17-1/2" x 49-1/2"
AQ-P-36-040-N 4000 lbs. 36" 7" 43" 19" x 48"
AQ-P-36-040 4000 lbs. 36" 7" 43" 23" x 47"
AQ-P-36-060 6000 lbs. 36" 8" 44" 23" x 47"
AQ-P-48-030 3000 lbs. 48" 7" 55" 23" x 59"
AQ-P-48-040 4000 lbs. 48" 8" 56" 23" x 59"
AQ-P-60-020 2000 lbs. 60" 7" 67" 23" x 69-1/2"
AQ-P-60-030 3000 lbs. 60" 8" 68" 23" x 69-1/2"
AQ-P-72-020 2000 lbs. 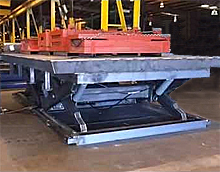 72" 10" 82" 23" x 75"
Today's answer for heavy lifting in the warehouse and distribution center is lift tables and positioners. 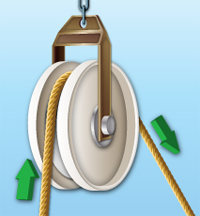 They use a different form of mechanical advantage to reduce the amount of force a person must use in raising and lowering loads. Frequently, the only labor now required is the actual transfer of the load from the lift horizontally to another location, whether conveyor, pallet, or work table. 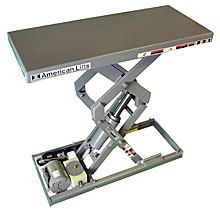 The idea behind lift tables and positioners is to put the load at an advantageous height that removes the need to bend and lift in order to transfer the object. The less bending and lifting done, the less chance for injury to the back and the entire musculo-skeletal system. The best form of ergonomics, of course, is to remove the need for manual transfer altogether. That's where scissor lifts are especially helpful. They can be raised and lowered to the precise height needed to slide a load onto and off the lift's platform. When that transfer can be done with a conveyor, fork truck or other mechanical method, workers are saved from the potential for injury down the road and possible disability if left untreated. The mechanical advantage is out there - save your workers from back breaking lifting. 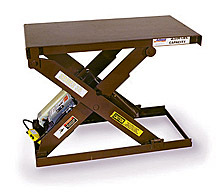 You'll also find lift tables even out the strength limitations among workers. Even the puniest person can keep things going when a scissor lift is used instead of brute strength.